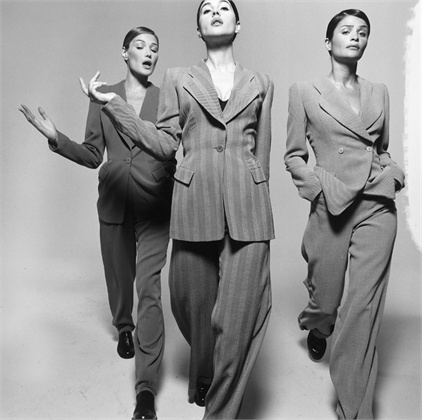 Just about the best example ever of the beautiful glide and drape of classic Giorgio Armani suits: the impeccably dressed trio of Helena Christensen, Carla Bruni, Monica Bellucci for Vogue Italia, July 1995. This photo was taken by Michel Comte, a Swiss artist, photographer, who was extremely influential in 1980’s and 1990’s fashion and styling photography. Interestingly I have discovered an old Giorgio Armani suit in my wardrobe, purchased circa 1998 during a rush of blood to the head, that has some of these styling notes – the wider lapels, the longer-length jackets. Sadly it did not make me look as good as these models. As I troll around the internet studying the topic of fashion a little more deeply, I am struck by the number of people who follow fashion as opposed to style. The difference is, I think, a combination of elegance, quality and time. Just by casual inspection, as a fashion outsider, I can see that fashion items — the current “must have” outfits — are trying a little bit too hard to be cool; too many things are going on at the same time, too many things look cheap and gimmicky, and although they may look interesting today, they will fade rapidly into history. Style, on the other hand, seems to happen in a very natural, organic way, without seeming to be forced. Everything works together in a delicate, soft, simple blend, without tricks or flashy, crowd-pleasing details. If you look at an Armani suit from a 15-20 year-old Vogue, it would still look incredibly up-to-date today. Fashion seems to feed on fads, things with (literally) a short shelf life, whereas style has a timeless quality that seems to work forever. And I mean quality in both the quantitative, Western, measurement sense, and quality in the Eastern, qualitative, intuitive sense — you can measure and feel the qualities of the garment. To avoid becoming an expensive fashion victim, then, the choice is clear: stick closely to designs and designers who have reached similar conclusions, and who make clothes that exist above fashion, in the domain of elegance. At the high-end the tailoring of a suit has to be impeccable, flawless. 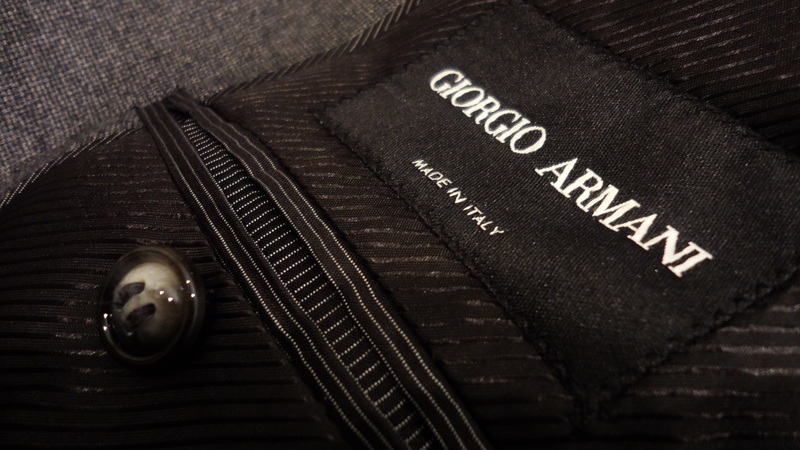 The above detail of a new ready-to-wear Giorgio Armani suit I bought less than a week ago shows the neat, perfect edging of the lining, and the deep lustre of the button chosen, no doubt with great care and thought, to close an out-of-sight internal pocket. Today I had the mother and father of all clear-outs. Everybody occasionally clears out their wardrobe to make way for new items, but today I dumped literally 80%-90% of my clothes into the recycling bin — including suits and shirts from labels like Brooks Brothers, Hugo Boss and Joop, and even some suits I had tailored in Hong Kong. Ties, belts and shoes saw no mercy either, although I did discover I owned a pair of Prada shoes (they stayed). Actually, to be perfectly frank, it was not that hard at all. Many of the items had been languishing in the cupboard for years without use, some of them were ill-fitting or were bad choices from the start, and have not been worn since they arrived in a shopping bag some years ago. They were just taking up space and I felt no pain at all ditching them. Other items like business shirts saw more regular use, but no longer fit the styling goals I have in mind, and what I wanted to do was to remove the option of lazily picking them out, to avoid any retrograde motion. When you are convinced you are taking the right decision, everything seems to stem easily from that source of certainty, and I am certain I am moving in the right direction. The textiles used by Giorgio Armani are hugely impressive. One of the first things you notice after the styling is the way the clothes sweep and drop off the body in very natural folds and flows, displaying what tailors call the drape of the fabric, as well as the way the designer has used the cut and direction of the weave to create shape. 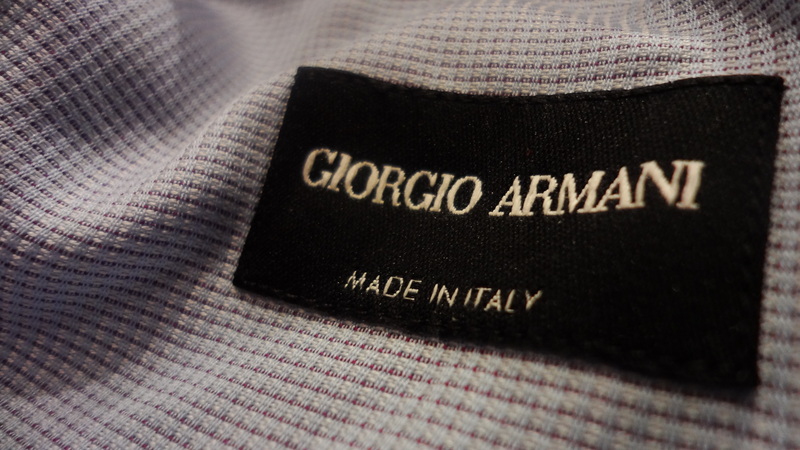 Giorgio Armani is quite famous for creating a certain look, and it’s one that you know immediately when you see it. Frequently his designs include muted blue, grey and gold colours, carefully shaped waists, soft, luxurious textiles, and flowing pants with a tailored hip — all elements that you can find across the ages of photographs of Armani collections. Just looking back to adverts from the 1990’s shows that as much as he updated his lines with new fabrics and tones, the basics stay almost exactly the same. You can find many criticisms of Giorgio Armani for this trait, with some fashion journalists accusing him of basically re-cycling the same look over and over again — although it is usually politely phrased to avoid being excluded from runway shows. That’s an interesting and perhaps quite unusual assessment from a fashion designer — that his clothes make financial sense. But I can tell you I find that re-assuring. I think this project is going to cost me a small fortune over the next few years, and I want to have some sense that my investment is safe. At my age, I don’t really want to be buying a fashion trend that will go out of style next weekend; I want to be buying a fundamental style that will keep me happily well-dressed for a decade or two.